What would China have in store for us this time? 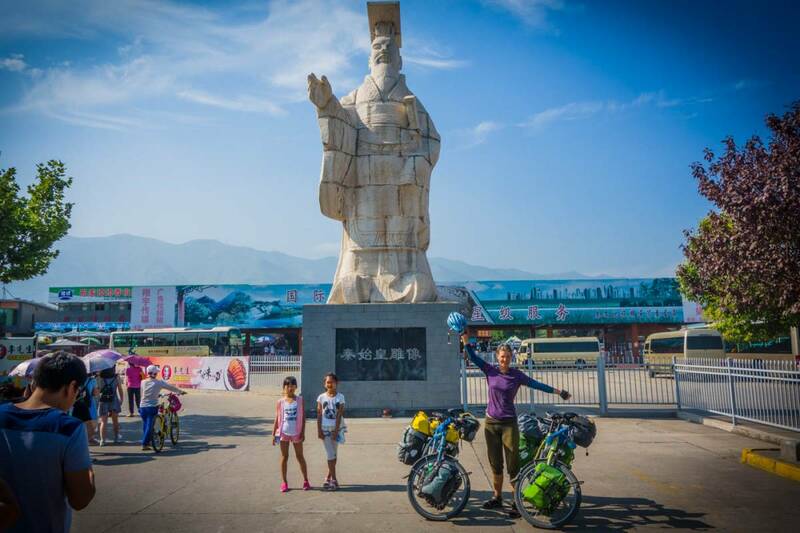 After cycling the Northwest and Northeast we are now on our way from Qingdao to Xi’an to shortly get back on the Silk Road. 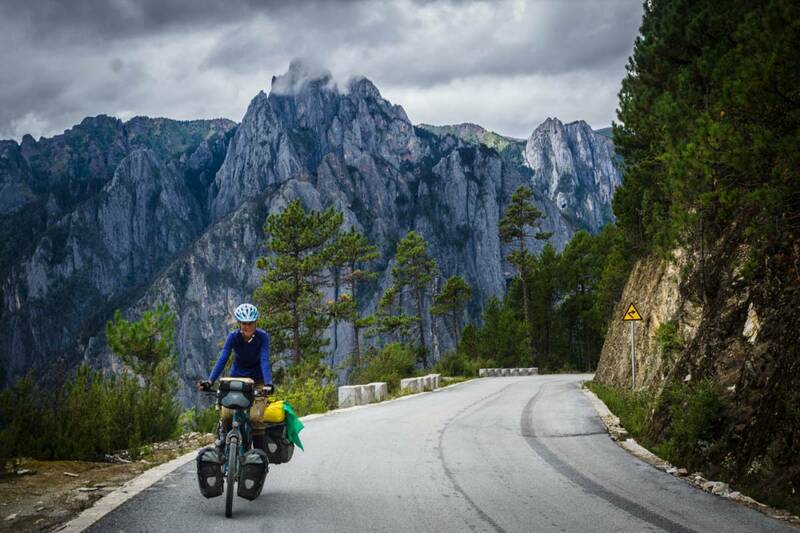 In China a route of 4500 km and more than 80000 meters elevation gain is waiting. Excited is maybe not the right word, but we were on our way back to China on the ferry from Incheon to Qingdao, a 17 hours boat ride. A double room with shower and a dirty carpet on the floor. That being said, this ferry was in the best shape of the three ferries we have been on to get to and from Korea. We were happy to be on the way. 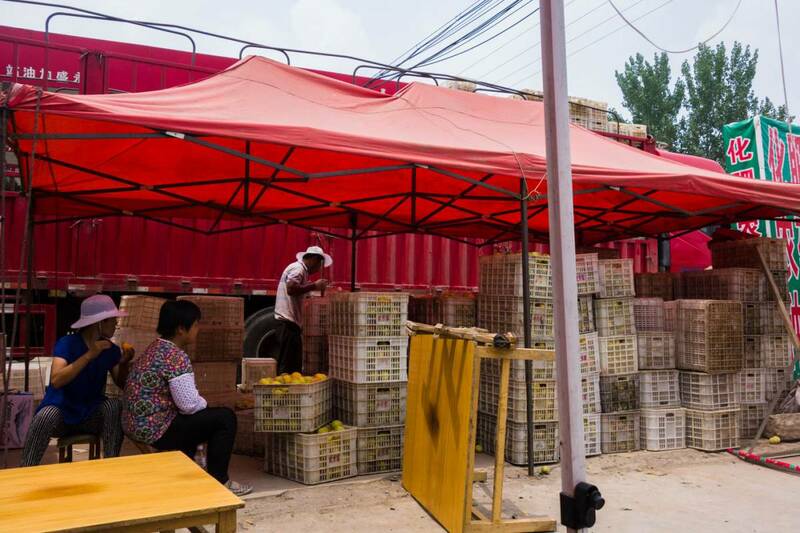 Photo’s of the stretch from Qingdao to Xi’an are here: Qingdao to Heze, Heze to Mianchi and Mianchi to Xi’an. Arriving in China as always confusing. We had to get on the bus with our bicycles and panniers to get to the immigration. Due to the MERS outbreak in South Korea the Chinese had set up scanners to scan body temperatures and when Martin walked through it all beeped. He had to go and get his temperature measured. This was done with and old fashion mercury thermometer in the armpit. It was all good and 36.3C so we could enter the country of China for the third time. Qingdao famous for the beer Tsingtao, the beer we left alone as we new next stop would be Xi’an. Being some 1350km away we needed to get on the bicycles and get on the road. 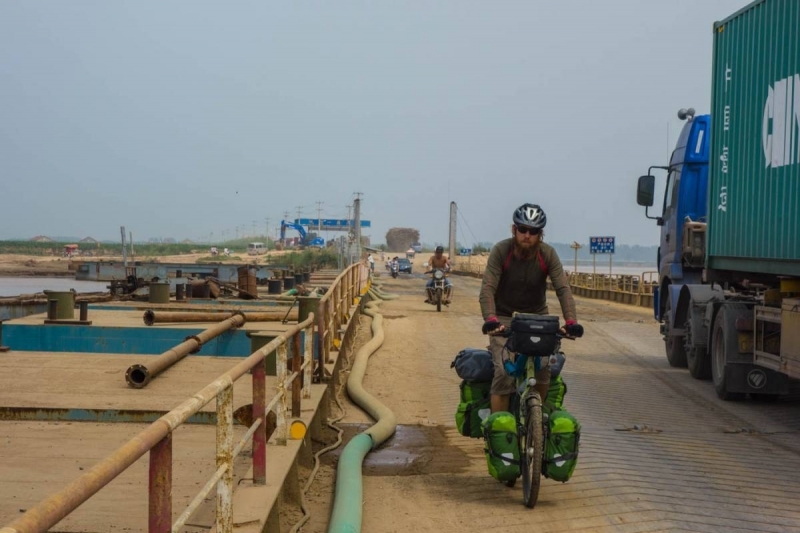 We cycled along the beaches of Qingdao filled with Chinese and green algae. The weather was hot some 32c degrees and we were sweating. The route we had planned would cross a section of water through a tunnel only when we got there we were stopped by the police. Through their nice gestures and sounds we understood that we were not allowed to cycle through. Bummer… This meant cycling a round at least 60-80km extra ;( Not something we really had in mind. We cycled off and 800m down the road we saw some Chinese cyclists at what looked as a rundown factory. This appeared to be a boat terminal and we were lucky to get on this boat across the waters. After this intense little boat ride we were finally on the road and in China we were hot and sweaty so stopped for a cold coke at a small shop. This is China, good and bad, but drinks and food is always available. The Chinese cyclists passed us and we passed them this continued the rest of the day, then at a big crossing we lost sight of them and we were on our own. We cycled past some building sites and got so dusty from the big trucks passing us. We wanted to be in Xian as fast as we could but still being able to enjoy this part of China which might not be the most interesting because of a lot of traffic and a high concentration of people. Anyhow we wanted to cycle to Xian and give it a chance. We had set ourselves a goal of 100km each day and no rest days before Xian. This meant 14days of continuous cycling which we have never done before, usually max 10days, so a small challenge. 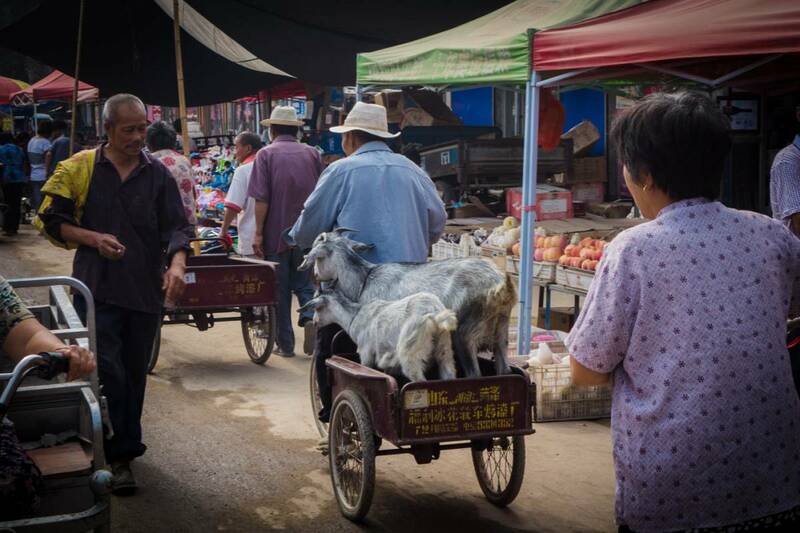 Qufu is the birthplace of the creator of the Chinese society Confucius. We had planned to visit the temple there and see some sights. We arrived there in the morning had a snack found the temple entrance and hundreds of Chinese tourist the entrance fee was 110 yuan per person… Well well yet another tourist place (and Chinese tourist trap) and we cycled off without visiting the temple. The days were not filled with beautiful sights as this part of china is industrial and agricultural meaning not much is left for the eye to enjoy. 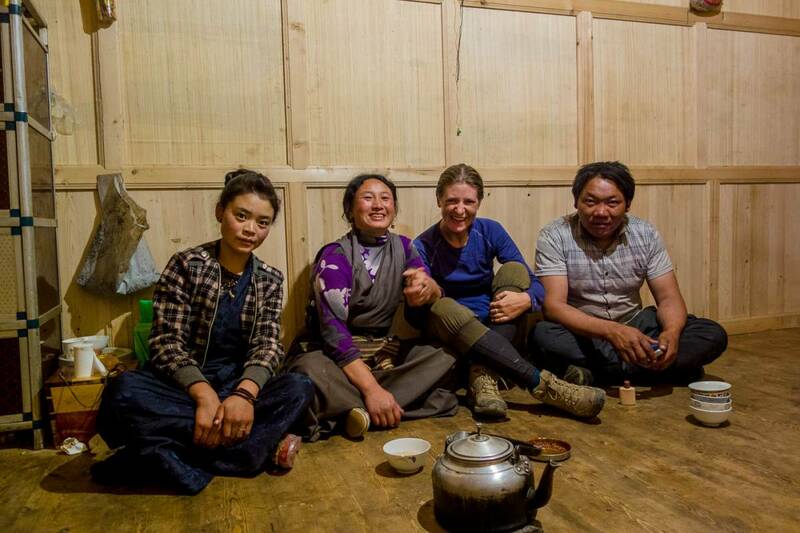 We still managed to find some decent campspots for the night and people were always friendly. Almost every campspot had many many crickets which made an enormous amount of sound. Often we here them next to the road. It is amazing how loud they can be. We would see lights in the evening searching for crickets. Apparently it is a nice delicacy, but we passed on that one. Along the way we passed more peaches and watermelons than we have ever seen anywhere. We even had a watermelon traffic jam! Several times we got peaches offered still the peaches of Iran were better. We had planned that half way we would see if we could find a hotel with a shower. 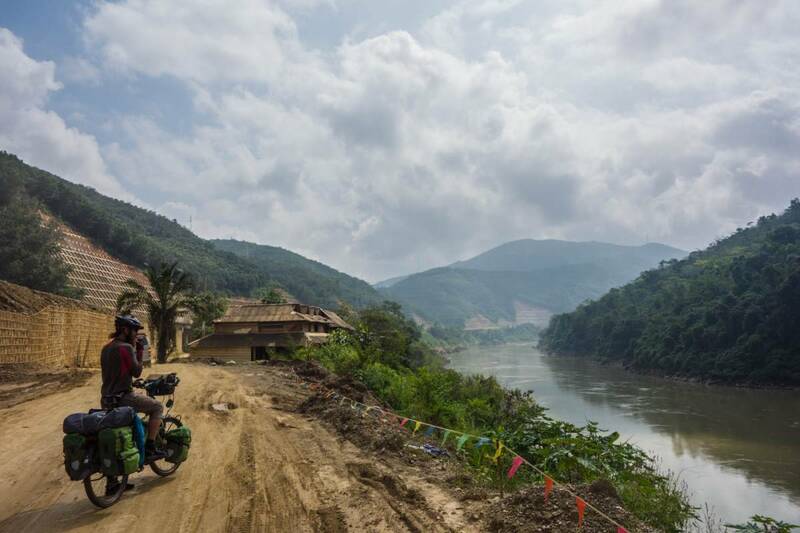 The stop was made in the city of Heze, a buzzling city with 1.4 million people we found a small hotel. Washed all our clothes which were so dirty from the last 6 days. 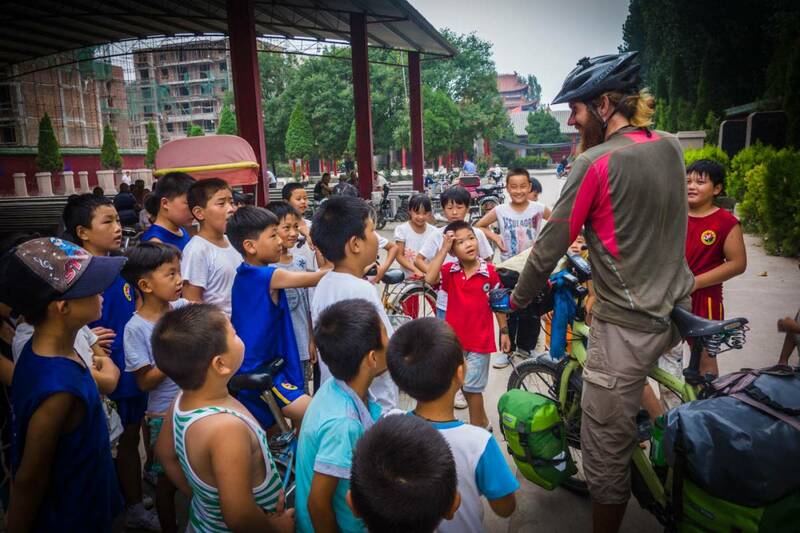 We left Heze and cycled through some small villages. We were a bit off the map as the roads did not exist on the GPS so some searching for the right roads made the day a bit more exciting. Also the small roads were interesting and village life was nice to see. After staying in the hotel we had a few days which were a bit unlucky to us. Apparently the day before the hotel night a huge worm wanted to stay in our tent after packing it in. So when camping the next night Martin was talking about a dead animal smell while packing out the tent. Only after a few minutes we realised this smell came from our tent. Our new tent, which had just been replaced because the zippers on the old tent failed. A huge dead worm was between the groundsheet and the bottom of the tent. The dead animal scent was in our tent because it had been packed in for two days. Needless to say we were no happy campers that night… Also the next night Martins mattress decided to pop. 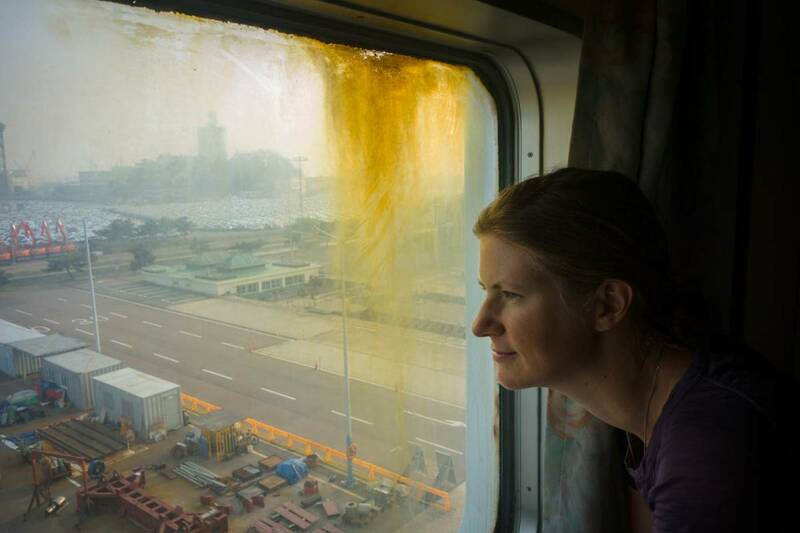 Susanne’s had done this before in Iran and now it was his turn which made us unhappy. The next day we were on the road, had lunch break in a city, found WIFI and we were happy. When we just cycled off we heard a sound and noticed it came from Martins front tire. 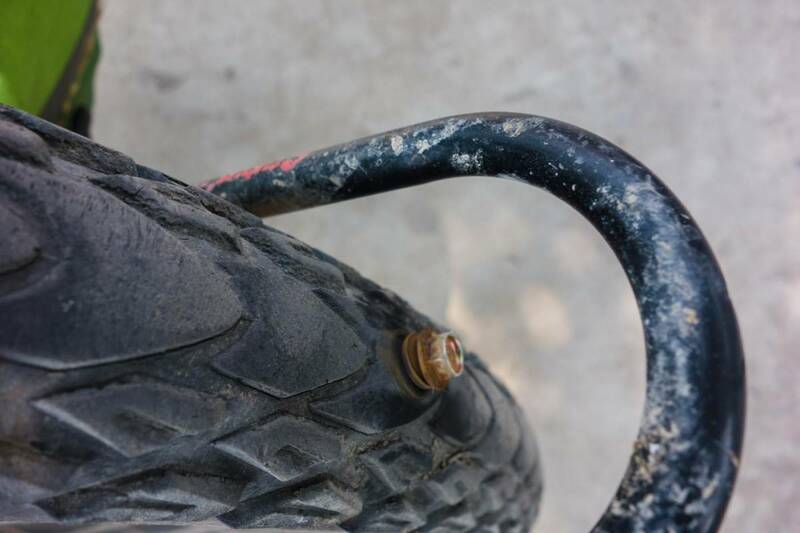 A huge screw had made its way into his tire. So before we were even on our way we had to spend time changing the inner tube and fixing it. Luckily it was a fast fix. We had arrived in Henan province. There was a river crossing coming up and we were not sure if there would be a bridge as we had no info on the GPS. The river was massive and we found out it was actually the Yellow river, this we had missed in the planning of our route. The Yellow river is the third largest river in Asia and the sixth largest in the world. The river has great importance to the Chinese and is regarded as the cradle of China as the Chinese civilisation developed at the banks of the Yellow river. So crossing the river would have been impossible so we were glad to see a floating bridge. Along the Yellow river we found more culture. We stopped by a temple where we got invited to the class of the monk who was teaching about creation of man, we think, not sure as all was in Chinese. This was a Buddhist temple on the banks of the Yellow river. Same day we stopped at another temple which turned out to be a Tao temple, this was our first visit to a Tao temple and all the faces of the figures were a bit of a surprise. We had two highlights on this trip. The first being a market in a village on a small road we had planned to cycle which was filled with people and market stalls. Loads of food, vegetables, things and people and it just went on and on and on. We enjoyed the people and looking at their wares and of course the snacks at the market. The other highlight was during a very boring straight day. We came across a town and all of a sudden there were old buildings which looked nice. We looked inside and people were preparing for Wushu training. Off course there was a men’s corner where men played games and there were many many kids which enjoyed our presence and ran after us while we looked around the buildings. Then the clock rang five and all of a sudden they went to their Wushu training. Very nice experience! The hills arrived and we climbed to 700m, was a nice change as everything got much greener and lees populated, still the roads were busy. The massive trucks passing can be nerve wrecking but we are more or less used to this by now. We enjoyed lunch and snack stops in all the small towns. Usually when we stop a crowd gathers and we get a chance to interact with the people a bit. They always ask the same questions though and more of course, this we just don’t understand.. Where are we going and where are we coming from ? Huashan, is one of China’s five sacred mountains, and has a long history of religious significance. The mountain has five main peaks, of which the highest is 2,154.9 metres. It is a well known mountain and now a major tourist attraction to the Chinese. We passed the place and saw the bus loads of Chinese going up to the mountain. These tourist places are so busy and unattractive that we did not even think of joining a trip to the mountain this is really an issue when things go mainstream in China the feeling of the places disappears. Xian was now in reach. On the last day we were getting very fed up with the big trucks and by coincidence found a small road when searching for a campspot the night before. One of our worst campsite and a beginners mistake because the ground was so hot we couldn’t sleep and Martin slept outside and even braved the mosquitoes. It is now around 39 degrees during the day and the sun warms the earth packed ground. We cycled up this small road, next to a dam and then through back roads to the Terracotta Warriors were we had a small stop. We new we were not going to visit them that day but we cycled right passed so thought we might as well have a look and the crowds were massive so we made a few photos and cycled in to Xi’an. Here in Xi’an we have enjoyed a rest day and a day to the Terracotta Warriors which was a real treat as the place is really impressive. 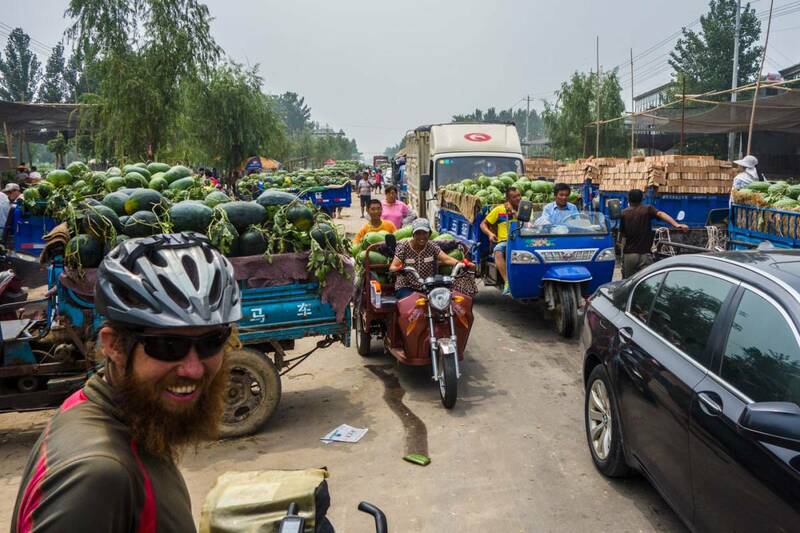 We had planned to cycle to Chengdu but realised that it would be more of the same busy roads and not so scenic. We long for the mountains now and when we get there we can’t wait to get down again, anyway we have planned a new route which should be more interesting to us. Hello from Skåne and Jonathan and Zara! We met you, Martin, on the plane to Moscow in June. What a treat for us to read your adventures! Thank you for sharing this adventure. Since Russia, I have been visiting friends and family in the USA, together we went to a Nature and Spirit festival in Italy where we did a ritual for a 300 year old Oak, a talk on the ecology of giving and receiving, a workshop on Living the Tree of Life, a round-table discussion on practicing spirit-consciousness, and eating amazing organic gelato and other Italian delicacies (including Rosso Detox – a sorbet made of red beets, carrots, ginger and lime)! Now we’ve just done 2 workshops here in Sweden and on Wednesday I am being interviewed for internet radio.